Okay, so we’ve created a new word. Just go with it. I have great friends. Whether I’ve known them for 4 months or 4 years or more…they’re great. They let me whine and moan. They let me go crazy when I need to. They get me out of the house when I really don’t want to, but they know I need to. They really support me and let me be me. And usually they keep their snide comments to themselves or at least wait until I’m out of ear shot. Thanks guys! One of the #1 things I LOVE about my friends? They let me bake them cakes, which lets me experiment on them. I don’t mean mad scientist experimenting, but food experimenting. One of said friends asked me to do this birthday cake last week. 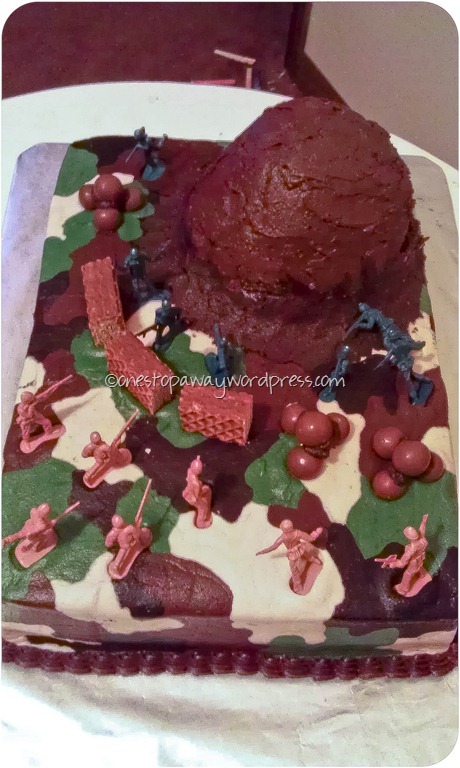 Not only did I get to try out a new cake filling, but I finally had a chance to try out one of my “Someday” decorating techniques: camo buttercream. 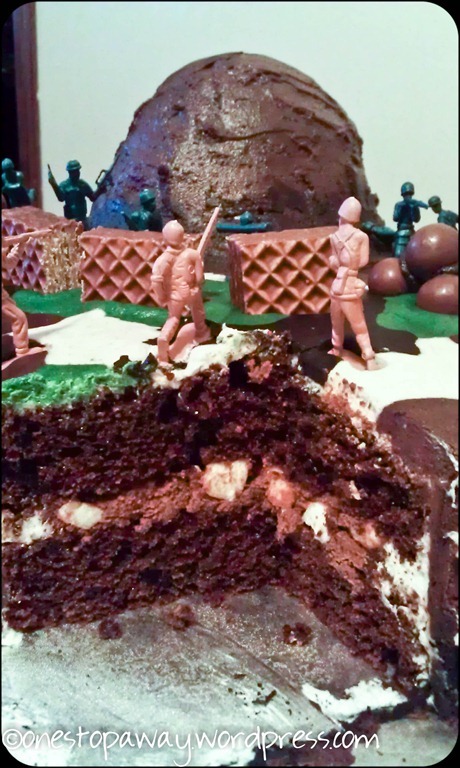 On the menu is a triple chocolate cake with rocky road filling and decorated with a soldier theme. Rocky road is traditionally chocolate ice cream, nuts and marshmallows. I knew I wasn’t doing ice cream, so I switched that to a light whipped ganache. Then I folded in mini marshmallows and toasted chopped almonds. Yum-O! I couldn’t wait. Preheat oven to 325 degrees. Prepare your cake pans. This cake was 9×13, so I sprayed my two cake pans with Wilton’s Bake Easy. Put cake mix, pudding mix, sour cream, water, oil and eggs into a large mixing bowl. I just dumped it all into the bowl of my Kitchenaid stand mixer. Blend on low for about 30 seconds. Stop the mixer and scrape down the sides of the bowl. Increase mixer to medium and beat for another 1-1/2 minutes — the batter will look like a thick pudding. Fold in the chocolate chips, making sure they are evenly distributed. Pour the batter into your prepared pans and spread smooth with a spatula. Bake in your preheated oven for 28 to 35 minutes or until a toothpick inserted into the center comes out clean. A 9×13 in my oven takes 40 minutes to cook through. Once the cake is done, remove from the oven and let it sit for about 10 minutes before turning out to cool completely. 4 oz. dark chocolate I used Nestlé’s Dark Chocolate Baking Bar because that’s all that was at the store otherwise I would have gotten Ghirardelli. Refrigerate your mixing bowl and beaters. Using a double boiler melt the chocolate pieces with 2/3 cup of the cream. This will go quicker if you’ve broken the chocolate into pieces. Remove from heat before the chocolate is fully melted and finish melting by stirring constantly. Set aside until no longer warm. In the chilled bowl beat the cream until traces of beater mars just begin to show distinctly. Add the cooled chocolate mixture and beat just until soft peaks form when the beater is raised. Not really much of a recipe. I folded marshmallows and almonds into the ganache until I was happy there were enough of each to be evenly distributed. And no, I didn’t taste test it every step of the way so that I would be able to tell you that this is one fantastic filling. Nor did I stand in the kitchen at 7 a.m. with the leftovers and a spoon and eat any of it for breakfast. Nope. Didn’t happen. Look at those yummy marshmallow bits! As far as decorating this bad boy, the camo effect is a lot easier than it looks. Time consuming? Yes. But I think it was worth it, and I’d be completely willing to do it again. 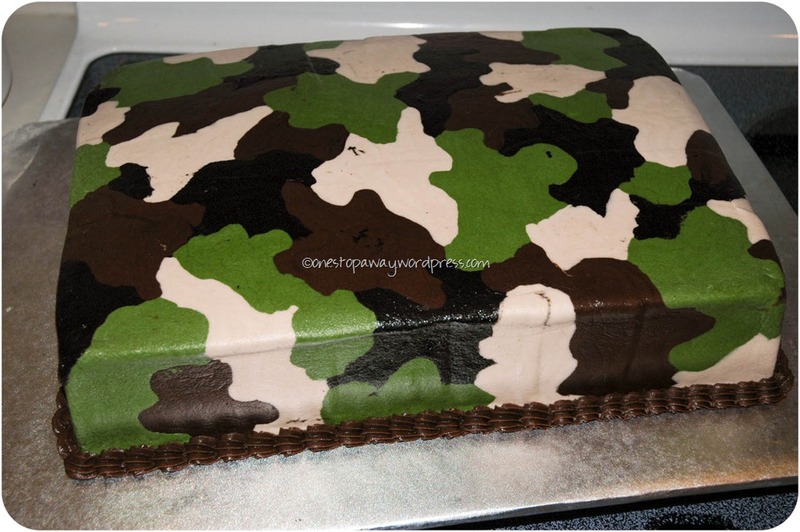 There are so many wonderful camo cakes out there, but for a quick and easy tutorial check out Dillicious Cakes’ tutorial album on Facebook. It’s better than anything I could try to explain, so check it out! Happy Birthday D! I’m honored to have been a part of your special day.